It was the same as every evening. The couple let their cat out to play in the yard. The difference this time? The cat decided to take an unintended trip that would be far more adventurous than anyone expected. It was the same as every evening. The couple let their cat out to play in the yard. The difference this time? She didn’t come home and took an unintended trip that would be far more adventurous than anyone, cat or owners, expected. On June 25, Lucy was let out by her owners, Michael and Meredith Welch, as was their ritual. “We let her out, she goes out every night, that’s her normal thing,” Michael told Live5News. When she didn’t come home, the couple was incredibly perplexed and worried. Four days later, when their Charleston, South Carolina, neighbor unpacked the car after a one-thousand mile plus drive up the coast to Falmouth, Maine, Lucy surprised them by coming out from under the vehicle’s passenger seat then taking off, presumably thinking she was on her way back to her own home. “There were a lot of different sightings all around, so who knows how far she went and where she actually went,” Michael said. 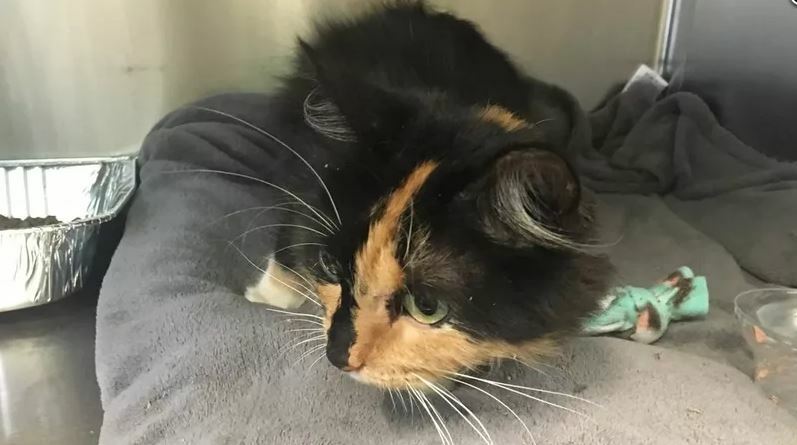 Thankfully, Lucy has since returned home, after being away for a month, traveling back with another volunteer who happened to have plans to travel to the Columbia area. The family is exceedingly happy to be reunited with their wandering cat. This story has a happy ending, because of the kindness of strangers and smart use of social media, but this experience serves as a reminder to all those who do allow their felines to venture outside to make sure they are microchipped and, if possible, monitored for their safety and owners peace of mind. And remember to update your addresses/contact/and emergency contact information, too. Again, I can not stress enough to not let the kids outside!! Cats have no reason to go outside. They are perfectly fine indoors and a hell of a lot safer. There are too many assholes just looking for the innocent to harm and murder. Just look at what is happening to the kids in if I’m not mistaken Olympia. Someone has dismembered several and leaving them in open view! Keep the kids indoors!! While I’m glad this baby is safe and sound and back with her parents. It could have ending up very differently.